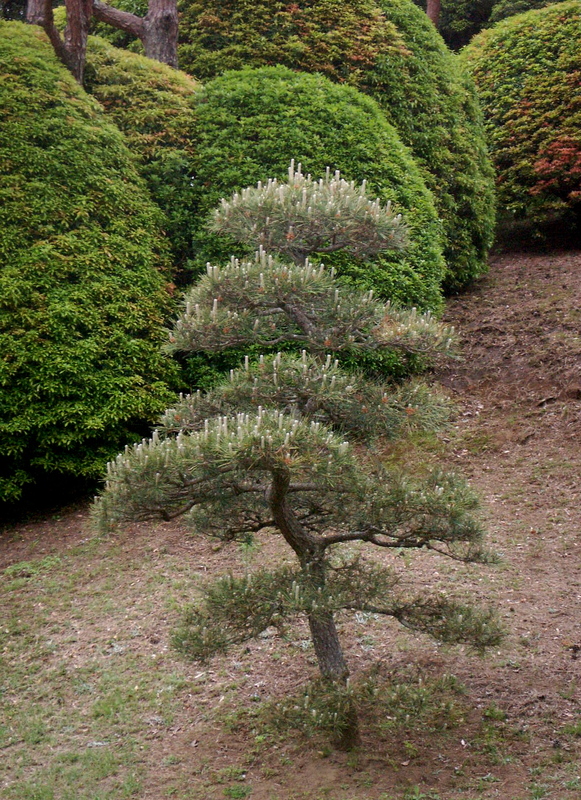 If I could, I’d pop over to Kyoto a few times a year. Anyway, it’s a great place – especially for the keen photographer or those seeking to feed their soul and find their wa, or harmony, in Kyoto’s ancient temples. For a person who loves historic architecture and artefacts it’s not so exciting as many of the buildings are replicas of the originals (wooden buildings need replacing quite often) and so they don’t excite me as much as the ancient structures you may see in other old cities.Of course, the stone buildings and gardens are often original. Kyoto is quite easy to get around – there are free maps, buses to all the temples/gardens/castle, well-signposted train stations and a taxi from one end of town to the other isn’t too expensive if you don’t feel comfortable with trains and buses. I have never used a guide book – it’s easy to find information at hotels/guesthouses and public information desks. A lot of the historical sites have most of the detailed explanation in Japanese – there is always some English but it may be limited, especially if it’s a smaller site. I know there are cheaper places but I love to stay at the New Miyako Hotel which is comfortable, reasonably priced and right in front of Kyoto Station.The breakfast buffet is great and it has absolutely everything: fruit, salad, pasta, toast, cereal, vegetables, fish – even my favourite – chips and ketchup! The helpful staff will assist you if you need to organise your itinerary. For more traditional accommodation see the Kinamata link at the end. There are so many places to visit but I’ll describe only my favourites. 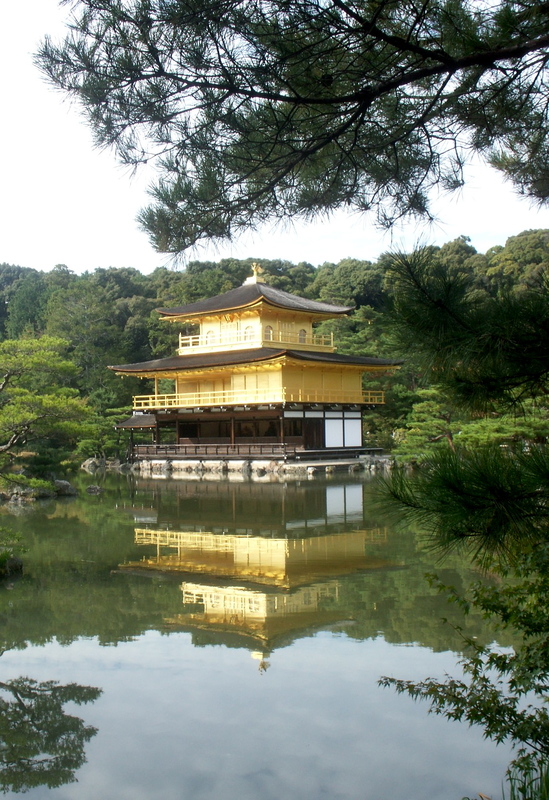 Kinkaju-ji (“Gold Pavillion”) is one of Japan’s most famous landmarks. Gorgeous. It is exactly what the name suggests – a temple made of gold. Unfortunately, the temple was burned by an obsessive monk in 1950 – fascinating story, check it out. Get the 205 bus from Kyoto Station. Entrance is ¥400 and the park is open from 9 to 5. There is a wonderful soba restaurant by the entrance to the park. Kiyomizu Dera (“Pure Water Temple”) is a UNESCO World Heritage Site founded in 780. This is a very sacred place in Hosso Buddhism.Although not as flashy as the Gold and Silver Pavillions, Kiyomizu is less touristy and more spiritual. You can see all the pilgrims climbing up the hill with their sistrums (pilgrim staffs) and making their way to the Main Hall and the the Jishu Shrine to the deity of love – it’s visited by those seeking a perfect match for themselves or others. Kiyomizu is very large and consists of several small shrines, gardens, a main hall and a very tall pagoda built around the Otowa waterfall. The waterfall is divided into three streams and drinking from the water, depending on the stream, is said to have benefits such as a happy relationship and successful studies or good health. Drinking from more than 2 streams is considered to be greedy and very back luck, so choose carefully! 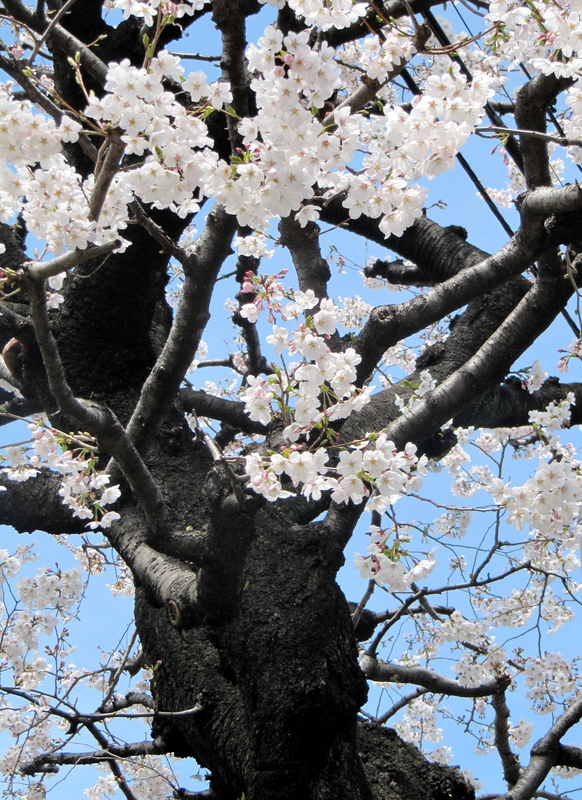 The site is surrounded by cherry blossoms and maple trees so, even though it’s beautiful all year round, I love Kiyomizu in Spring when all the cherry blossoms are in full bloom – it’s like pink snow! The Hanatoro (“Flower and Light Road”) events are nighttime illuminations held every March is Kiyomizu Dera. They are traditionally held with lanterns but these days they are assisted by lasers and electric lights – very impressive! From the wooden platform you get a great view of Kyoto. The street leading up to Kiyomizu is famous for it’s pottery and fine china. I passed the shops with the ¥40,000 plates and got a lovely vase for ¥1500 – I got it years ago and still admire it every day.Entrance is ¥300. Take the bus from Kyoto station, it’s about 15 minutes. The Rinzai school of Zen has its headquarters in Nanzen-Ji, a temple compound established in 1291.There are hiking trails – some of them quite long – and zen wells and you can have a cup of tea in the zen garden.Some pilgrims come to pray by the waterfall, there is a tiny hidden shrine hidden in the forest called Oku-no-in – ask at the reception desk if you wish to find this little treasure.Most of the grounds are free to explore. The Museum of Kyoto is great. 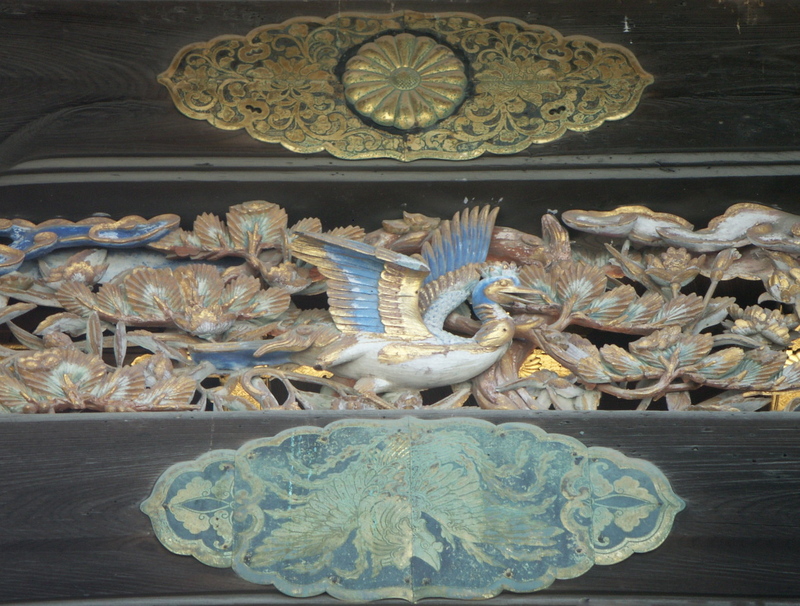 It’s housed in a Meiji period building, formerly the Kyoto branch of the Bank of Japan. They have exhibits from all over the world and a floor on Japanese history.There’s an artifical Edo period street which is cute and a the old european tea room is great – very appropriate for such a building. There are so many good places to eat in Kyoto – I’ve had really good soba noodles, Italian, Cajun and Sushi in this town. It’s good to try a kaiseki meal at least once. This is the imperial banquet and Kyoto is famous for there haute cuisine. These course can be a bit strange for many foreigners and very expensive – some as much as ¥30,000. Kaiseki is considered to be an art form and uses fresh, seasonal ingredients to create several courses that feature different taste, texture and colours.The presentation is always beautiful. Very Wabi-sabi. 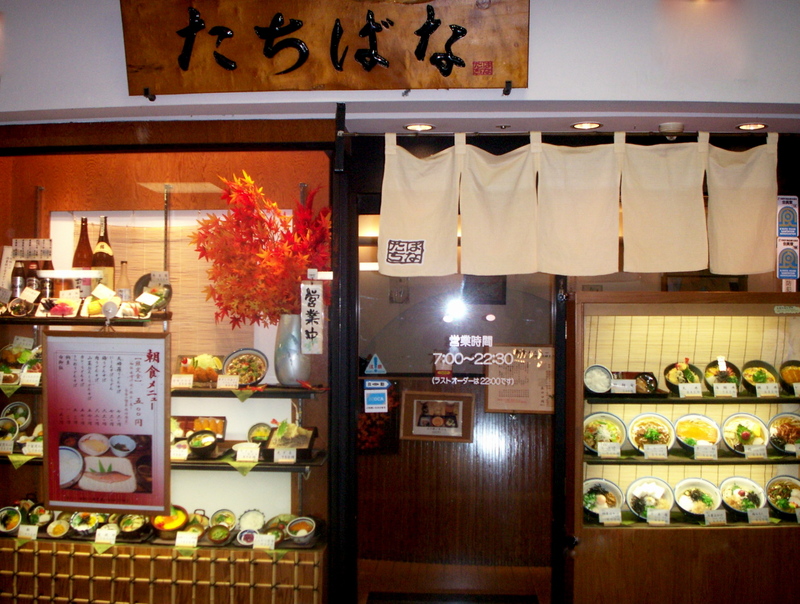 I like the Kinamata kaiseki because it’s… well, it’s great and every season they have a special menu. The Spring Course included sushi, lily roots, soup, baked snapper, tilefish and mushrooms and salad. This place is a ryokan (Japaneseinn) with a beautiful garden and traditional tatami rooms with shoji screens. Kinamata offers Japanese cooking classes as well Dinner is about ¥15,000 – 27,000 but lunch is ¥9,000 and up. It’s much cheaper to sit at a table than Japanese style on the tatami. If you stay for the night it’s about ¥40,000 with 2 meals. Regarding Kaiseki: you only need to do it once, so it’s worth the expense. If you don’t like fish, call one day in advance and ask for vegetarian or shojin ryori as opposed to kaiseki ryori. Most places will do this for you. Reservations are always required. Other places to eat are very reasonable. I found this soba noodle shop at Kyoto Station with my parents and we had dinner (noodles, rice, soup, tempura and vegetables) and drinks and the whole bill was less than ¥5000. We were thrilled! 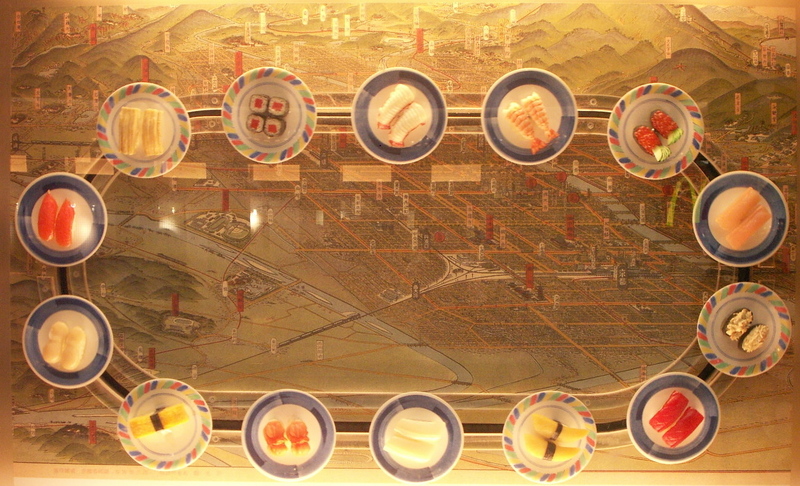 There’s always the sushi train – this one was also in the station, the display goes round and round: fake sushi on a fake sushi belt.